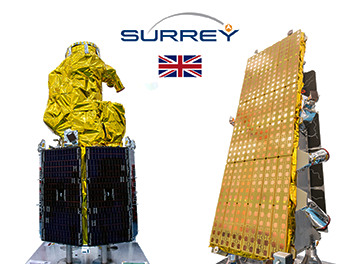 Surrey Satellite Technology Ltd. (SSTL) has confirmed the successful launch of two satellites, NovaSAR-1, a Synthetic Aperture Radar (SAR) satellite, and SSTL S1-4, a high resolution optical Earth Observation satellite. The two satellites were launched into a 580 km. 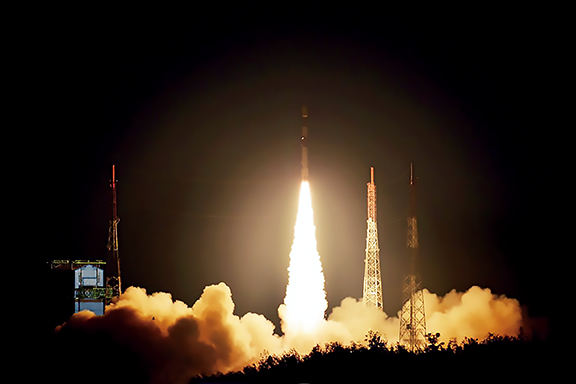 SSO on board the PSLV launch vehicle from the Satish Dhawan Space Centre in Sriharikota, India, on September 16 at UTC 16:38 by Antrix Corporation Limited, the commercial arm of the Indian Space Research Organisation (ISRO). The ISRO PSLV-C42 launch of the SSTL satellites. Photo is courtesy of ISRO/Antrix Corporation. NovaSAR-1 will be the world’s first commercial SAR satellite to be operated at a 10:30 equator crossing time, providing time diversity for radar observations by affording increased daylight imaging opportunities in addition to night acquisitions. Synthetic Aperture Radar is a powerful tool for monitoring the Earth from space due to its ability to see through clouds and image the Earth night and day, and a constellation of three NovaSAR satellites could image any point on the globe every day, regardless of local time or weather. 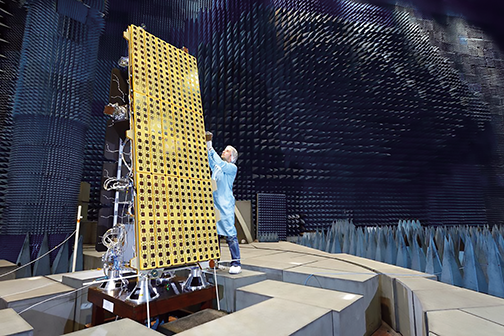 SSTL's NovaSAR-1 on test at Airbus, Portsmouth UK. Photo is courtesy of Airbus. NovaSAR-1 was designed and manufactured by SSTL, with an S-band SAR payload developed by Airbus Defence and Space in Portsmouth and an Automatic Identification Receiver supplied by Honeywell Aerospace. The SAR payload has a dedicated maritime mode designed with a very wide swath area of 400 km. to enable the monitoring of the marine environment, and will provide direct radar ship detection information simultaneously with AIS ship tracking data to assist with the identification and tracking of sea-going vessels. In addition to operating in maritime mode, NovaSAR-1 has been optimized with three additional imaging modes, including a six meter resolution imaging mode, for a range of other applications, such as flood monitoring and agricultural and forestry applications. The satellite has been designed to offer a high throughput of data, observing in a variety of polarization combinations to additional information to acquisitions in the form of ‘color’. Photo of SSTL's S1-4 satellite. Image is courtesy of SSTL/B. Schwarz. The SSTL S1-4 satellite is a sub one meter EO satellite identical in design to the three DMC3/TripleSat Constellation satellites launched in 2015. 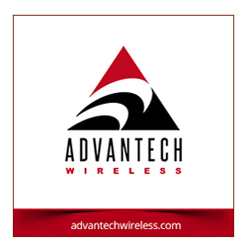 A contract to provide data from SSTL S1-4 was signed with Twenty First Century Aerospace Technology Co., Ltd. (21AT) in February of 2018. As manufacturer and owner of the satellite, SSTL will lease imaging capacity to 21AT for the lifetime of the satellite, designed to be in excess of seven years. 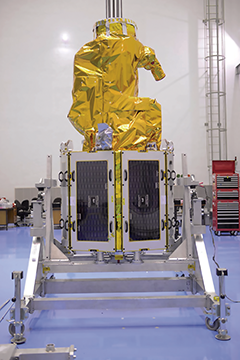 SSTL S1-4 will contribute sub one meter resolution image data into 21AT’s existing TripleSat Constellation service, comprising three SSTL DMC3 satellites launched in 2015. SSTL S1-4 is capable of acquiring multiple targets in one pass, using spot, strip and mosaic imaging modes and 45 degree off-pointing agility for a range of applications including urban planning, agricultural monitoring, land classification, natural resource management and disaster monitoring. The very high resolution imager on board the spacecraft has been designed and manufactured by SSTL and will acquire sub one meter resolution images in panchromatic mode and sub four meter resolution images in multi-spectral mode, with a swath width of about 24 km. The systems on board both satellites are being commissioned on orbit from SSTL’s Spacecraft Operations Centre in Guildford UK. Sir Martin Sweeting, Executive Chairman of SSTL, said that he was pleased to confirm that successful contact has been made with both satellites and they are in good health. Sir Marin thanked the Indian Space Research Organisation and Antrix for a successful launch that achieves SSTL's long-held ambition to deliver low cost SAR remote sensing capabilities and services to the firm's global customers and enhances the company's Earth Observation capabilities with a sub one meter optical mission. Science Minister Sam Gyimah added that the data from this satellite, backed by a £21 million investment from the Government, will help innovative start-ups develop new apps that could revolutionize the way we live. This is a great example of how the UK Government is working with the space sector through the nation's modern Industrial Strategy, ensuring the UK remains at the forefront of pioneering science and exploration. Minister of State for the Department for International Trade, Baroness Fairhead noted that SSTL is a fantastic example of how UK innovation and engineering can have a global impact. The UK's space industry is thriving, resulting in significant growth which reinforces the nation’s reputation as a leader in the sector. Dr. Dave Williams, Executive Director of Digital, National Facilities and Collections at CSIRO, remarked that through the organizatin's share of NovaSAR-1 tasking and acquisition time, the significant role of CSIRO will be extended. Australia’s national science agency already plays in managing a range of national research facilities and CSIRO will be making time on NovaSAR-1 available to Australian scientists. The satellite provides significant opportunities to support a wide range of existing research, further develop Australia’s Earth observation data analytics expertise, and create new opportunities in the field of remote sensing.